Osnat Netzer is a composer, pianist and teacher living in Boston. She is winner of the ASCAP Morton Gould Award, the Boston Modern Orchestra Project Competition, the Zeltsman Marimba Competition and the Donald Martino Award for Excellence in Composition. In 2009-10, she lived in Berlin through the funding of the Beebe Fund and there completed her opera The Wondrous Woman Within on a text by Hanoch Levin. Osnat is also active as a pianist in classical and contemporary concert music, as well as improvisatory folk-, klezmer-, and jazz-influenced works. 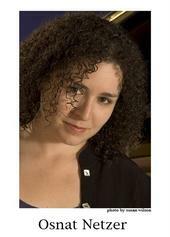 Recently, she was appointed adjunct professor at New England Conservatory. Osnat was born and raised in Haifa, Israel. Bachelor’s degree, Jerusalem Academy, Master’s degree, Mannes College of Music, D.M.A. New England Conservatory, studies at Universität der Künste, Berlin, Bowdoin Music Festival, Tanglewood. Composition with Lee Hyla, Robert Cuckson, Daniel Ott, Iris ter Schiphorst, Menachem Zur, Zvi Avni, piano with Inessa Zaretsky and Esther Narkiss.